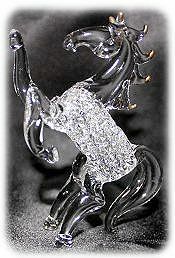 This proud glass stallion has gold tipped ears and mane with a sparkling crystal clear body. With his front hooves pawing the air, this lively horse figurine will please any collector! Use with a color changing LED light base for added effect. 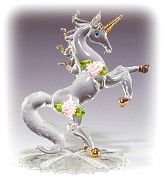 Charming spun glass show horse has a frosted mane and tail, sapphire crystal eyes and delightful gold trimmed Stars and Stripes saddle. 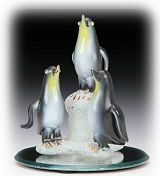 This hand crafted spun glass figurine includes a beveled oval mirror base and a glossy gift box. Gorgeous hand spun Red Exotic Frog, fashioned after the colorful poisonous frogs of the Amazon. 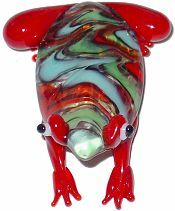 These clear glass frogs have bright colored scalloped designs on the body and bright red legs, use as a paperweight or as unusual collectible frog. This gold-trimmed, playful Mama and Baby family in lifelike clear blue glass is a must for the elephant collector! 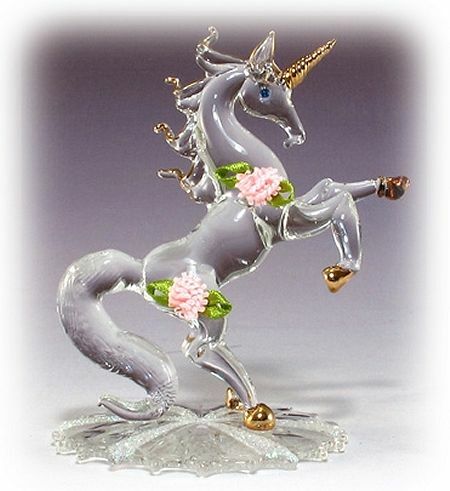 This hand made spun glass figurine has an oval beveled mirror base and cannot be used with an LED light base. 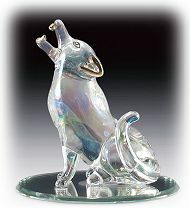 Rainbow hued clear glass Wolf howls at the moon! Add this artistic rendering of a lone howling wolf to your collection. 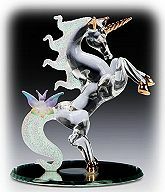 Use with a color changing LED light base for added effect. Irresistible Murano glass Blue Exotic Frog similar to colorful poisonous frogs from the tropics. These clear glass frogs have bright colored scalloped designs on the body and bright blue legs, use as a paperweight or as unusual collectible frog. 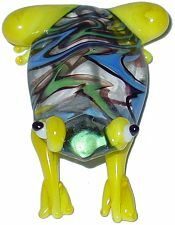 Murano style hand made Yellow Exotic Glass Frog looks like the colorful poisonous frogs found in tropical forests. These clear glass frogs have unique scalloped designs on the body and bright yellow legs, use as a collector's gift or party favor. Hand made Murano style Green Exotic Glass Frog are colorful and each one is unique! 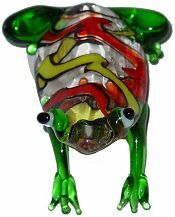 These clear glass frogs have bright colored scalloped designs on the body and green legs, add one to your collection or use as an adorable gift favor.